While the impact investing field has taken off in recent years and has influenced mainstream banking priorities, worker cooperatives are not yet a viable option for a typical impact investor interested in ‘investing with purpose.’ In other words, while assets under management in the United States’ impact investment space have grown to $15.2B, only a tiny portion of those investments are going into workerowned cooperative businesses. 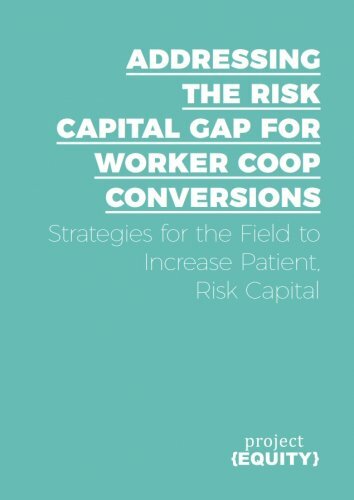 What would it take for an investor to be able to easily target part of their investment portfolio to worker-owned cooperatives, to ‘mainstream’ the practice of investing in worker cooperatives? Worker cooperatives provide a myriad of benefits. For worker-owners, benefits include better paying jobs, asset and skill building, and enhanced control over their work lives. For businesses, benefits include reduced employee turnover and increased profitability and longevity. For society more broadly, worker cooperatives foster social innovation, expand access to business ownership, and train people in democratic practices. Worker coops are also positively correlated with many health and other social benefits. However, in the U.S. today, there are only an estimated 3-400 worker coops.